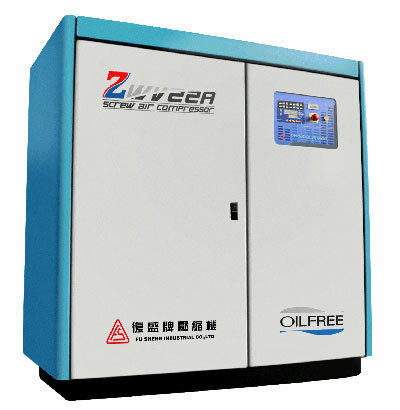 FS ZW Series Oil Free Screw Compressors produce totally Oil-less air with a water injected compression process that is completely free of any hydrocarbons. Highly efficient, fixed speed models deliver up to 15% energy savings over dry screw type compressors. Low operating temperatures, slow direct-drive running speeds ensure high reliability with the most advanced air end in the industry. Naturally "Green" by design, each provides high quality air, low dB(A) noise levels, efficient use of energy, and no oil discharge to the environment. Even service costs are very low with no oil filters, oil separators or oil to dispose. ZW 4-Stage Water Purification System with reverse osmosis membrane & water pump is furnished standard to remove all contaminants to provide clean, flat water to prevent contamination buildup on the internal components. Total water filtration, cleaning and automatic flushing ensure high air quality and long component life cycles. ZW Compressors are environmentally safe with high efficiency and are an extension of our current offering of Oil Less piston compressors. FS oil free compressors serve the majority of your compressed air needs.